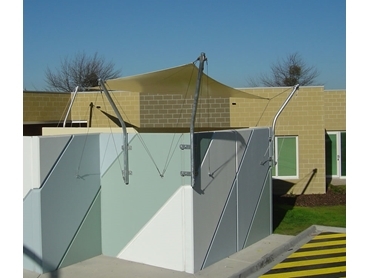 Maroondah Hospital in Melbourne needed shade sails for a new outdoor courtyard. Surrounded by high walls, this sizeable outdoor space had little UV protection for patients and staff. Correctly positioned shade sails can block out up to 95% of the suns rays and cut heat levels down dramatically. A creative shade sail solution was required as each sail needed to be fixed at the top of the wall. The courtyard was segregated into several areas making it an unusual shape. Mulders has an innovative floating shade sail design and was selected as the shade sail supplier. Mulders designed several irregular shaped shade sails to cover all parts of the courtyard. The sails were fixed with specially designed poles which could be securely fixed to the top of the wall. The poles were angled outwards from the courtyard to provide maximum shade span. Large bracket fixings were used for strength. Tensioning devices were fixed at multiple points around the wall to ensure the sail could be pulled taught in every direction. This elevated design had a smaller footprint that a traditional four pole design and could easily fit within this constricted space. For solid construction and durable tensioning, each supporting post had a large diameter. The sails were designed from a natural tone UV architectural grade PVC, complementing Maroondah’s own brick design. This high quality membrane was UV resistant and waterproof, able to provide good protection from rain and sun. Supporting posts were made from hot dipped galvanized steel, resistant to rain, salt corrosion and rust. The end result was a light and airy looking shade structure. Patients and staff could now relax outside in comfort, whatever the weather.